160XL037 TIMING BELT. 16" Length, 80 Teeth, 3/8" Wide, XL (.200") Pitch. Made by BANDO USA. Replaces: Grainger 1DHJ2, Gates 160xl037, JASON 160XL-037, Dayton 1DHJ2, MBL Synchrostar 160xl 037 for exercise equipment, office machines, hobby tools, machine tools, postage handling equipment, sewing machines, vending machines, agriculture, outdoor power equipment and more. 160XL025 HTD Timing Belt. 16.0� Length, 80 teeth, 1/4� Wide. 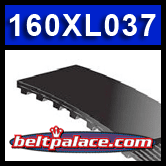 Neoprene HTD 160XL-025 Timing belt 160XL-025. Consumer Grade. 160XL050 Timing belt replaces A6R3-080037. 160XL050 Timing Belt. 16 inch OC x 80 teeth x 0.5" Wide. Replaces A6R3-080050. 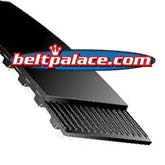 Neoprene 160XL - 1/2" Wide Timing belt.